Transform the air in your space—make it more aromatic and fresh. 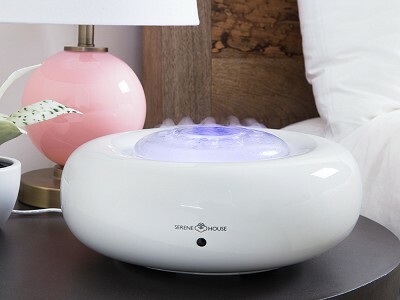 This glossy ultrasonic humidifier restores the moisture in a room with style. By resetting the humidity in the room, you’re also balancing the moisture in your own body. 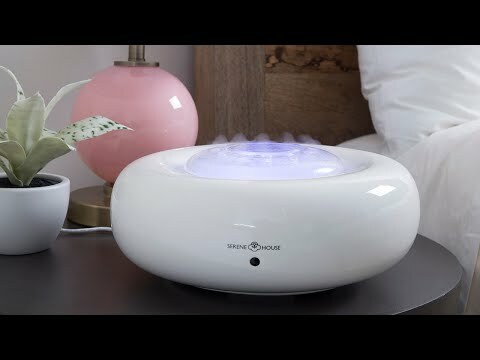 The ultrasonic vibrations from Serene House let out a fine, cool mist that hydrates your skin, can relieve your sinuses, and even lubricates nasal pathways to help you heal faster when you’re under the weather. From their most compact humidifier to one with an LED speaker, Serene House’s designs share a sleek, minimalist aesthetic and the potential for aromatherapy—add from five to ten drops of your own essential oils. The Blob, the smallest of the set, humidifies and scents up to 160 square feet (15 square meters), perfect for your office or a small room at home. The other designs mist up greater areas and have built-in speakers, mood lighting, and internal timers you can program to go off at your liking. 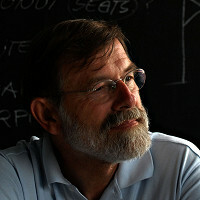 These humidifiers are the product of a rich collaboration between engineers and designers. This intentionality is evident in the design—both in functionality and looks, they’re a breath of fresh air. Hello everyone! 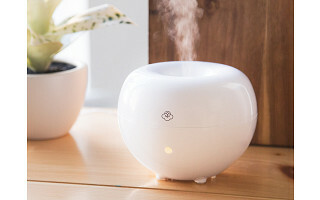 I'm proud to introduce Serene House Aromatherapy Humidifiers to The Grommet. I'd be happy to answer any questions you may have! Are the diffusers difficult to clean? I know how important it is to keep humidifiers clean. @Shirley Hi Shirley, our instruction manual says after daily use but it is depending on the oil you use. I always recommend that you wipe out any water residue left as frequent as possible so that you don't have water sitting in the unit. The Instant Fresh oil that comes with the machines, is very clean and you will not notice much residue at all. We recommend natural cleansers and using vinegar or alcohol is small dosage is the best way. These type of devices are typically easier to maintain than larger humidifers. Since essential oils don't mix well with plastic, what is the inside water tank made of? @Nancy Hi Nancy, the inside material is a BPA free plastic designed for this purpose. All suppliers use a plastic inside - I have not seen any other material for the inside in all the years we have been selling these types of units. The Essential Oil always float on top of the water surface and only has limited contact with the plastic. There are unfortunately no alternatives available. I am allergic to fragrance. Can this be used with plain water? @Paige Hi Page, yes you can use the machine with only water. It works a humidifier but the out put is only good for smaller rooms. But also remember that 100% Natural Essential Oils from Serene House are no fragrances, they are all natural so perhaps they work for you. How long will the Blob run until it shuts off? @Pamela The Blob is our longest running machine, runs for about 6 hours but the samples I have run about 8 hours and some individual machines can even run longer. But 6 hours is the guaranteed number. @Michael I just ordered the small unit. In the illustrations there is no power cord. How is the unit powered? @Juan HI Juan, these units are powered with electricity. An adapter comes with the unit and the cord is 5' long (60 inches). Are these diffusers electric or battery. I don't see a cord anywhere. If electric, how long is the cord. @Barbara HI Barbara, the cord is 5' (60 inches) for all units. Ho is the small unit powered? In the illustrations there is no power cord. @Juan Hi Juan, they are all electric usingg 110v and an adapter. I will be traveling with very limited space. Could you please tell me how big is the Blob diffuser? @Lynne Hi Lynne, the unit is about 5" x 5" wide circular and 4" tall. Transform the air in your space—make it more aromatic and fresh. 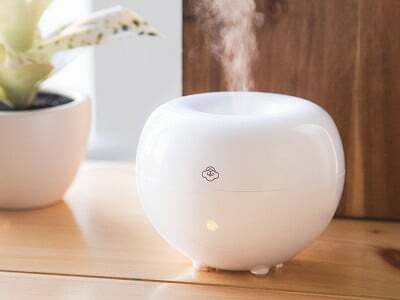 This glossy ultrasonic humidifier restores the moisture in a room with style. By resetting the humidity in the room, you’re also balancing the moisture in your own body. 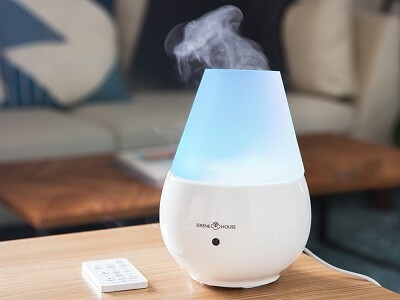 The ultrasonic vibrations from Serene House let out a fine, cool mist that hydrates your skin, can relieve your sinuses, and even lubricates nasal pathways to help you heal faster when you’re under the weather. From their most compact humidifier to one with an LED speaker, Serene House’s designs share a sleek, minimalist aesthetic and the potential for aromatherapy—add from five to ten drops of your own essential oils. The Blob, the smallest of the set, humidifies and scents up to 160 square feet (15 square meters), perfect for your office or a small room at home. The other designs mist up greater areas and have built-in speakers, mood lighting, and internal timers you can program to go off at your liking.